An Arizona hearth stove store is running a promotion where customers purchasing a new stove are given the chance to trade in their old one for a tax deduction. The old stoves are then donated to local families in need. We at the Alliance think this is a great idea, so long as the old stove is EPA certified! Assuming the hearth store gives these older stoves to a charity, and the donation receipt is from that charity, the customer can still get a decent tax deduction based on value of stove, even if the stove is disabled and given to a steel recycler. If this could catch on nationally, stove retailers could provide a great service to the air we breathe and help get their customers a nice tax break. And since the 10% federal tax credit is all but certain to disappear in 2012, this a great way to extend some tax help to customers. The Alliance would be happy to help try to expand what this Arizona store has started. Anyone interested? Want to stay warm this winter and make a difference at the same time? How? When you upgrade your home by adding or replacing your heat source with a new wood, gas or pellet burning stove and donate your old stove at Roof Dancers, the warmest little stove shop in Northern Arizona, you get a huge tax credit. Roof Dancers will donate your old stove, on your behalf, to a Northern Arizona Outreach providing quality alternate sources of heat to needy families. You get the tax credit and a family who can put your used quality wood, gas or pellet burning stove to good use gets the warmth, a real win-win. Roof Dancers is the area expert on long burning wood stoves. Stoves that heat evenly, last longer and conserve energy while helping the environment. Ask a friend, chances are they got their stove from Roof Dancers. Stop by and check out the all new Blaze King, the only wood stove in the market that looks great and can up to 50 hours on a single fill of wood. There’s nothing like it, Roof Dancers, on 4th street, next door to Sonic. 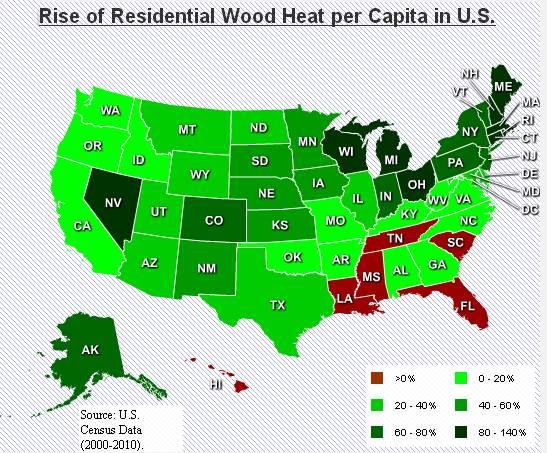 Wood was the fastest growing heating fuel nationally between 2000 and 2010, and in 25 states. But in some regions, electricity, natural gas, propane and even oil are experiencing rapid growth. Wood grew the fastest (+34.6%), followed by electricity (+26.8%) and natural gas (+4.9%), and both propane (-16%) and oil (-21.9%) experienced significant declines. But regional differences abound. In decline just about everywhere else, the South was the only region to have seen substantial gains in residential oil use. Texas (84.6%) had the greatest increase in oil use of any state by far, with Arkansas (36.75) and Oklahoma (35.7%) rounding out the top three. In both Texas and Oklahoma, oil grew the fastest of any fuel source. In Arkansas, it finished second to electricity (48.2%). The Northeastern United States experienced some of the biggest shifts in natural gas and propane use over the past ten years. Maine (44.8%), New Hampshire (39.4%) and Connecticut (27.1%) currently lead the U.S. in residential propane growth, and Vermont also ranks second among the states where natural gas is rising the fastest. In each of these New England states, however, wood still remains the fastest growing source of residential heating fuel. Other than Vermont, gas heating rose the most in Nevada (51%) and Idaho (41.1%). Propane use saw large increases in Pennsylvania (22.2%) and Washington (21.1%), in addition to the aforementioned New England states. Unlike wood and propane, the large increase of electricity in the U.S. is not confined to any particular geographic region. The states with the three biggest increases were Georgia (54.7%), Iowa (49.5%) and South Dakota (49.2%). Wood heat use grew fastest in the Northeast and Great Lake States, and fell in most of the south. If history is any lesson, the South may rise again, and heating demographics will continue to provide a fascinating and often surprising growth trends. In addition to regional growth rates, state ranking of primary heating fuel use is another lens through which we can understand the growth of wood heat. In 2000, wood was among top the top four heating fuels in 26 states, exceeding at least propane or oil. In 2010, wood was among the top four fuels in 33 states. In 2000, wood was the third most common heating fuel in two states (Oregon and Idaho), exceeding propane and oil. In 2010, it was the third most common fuel in five states (Idaho, Oregon, Vermont, Washington and West Virginia). Finally, in 2000 and 2010, wood was the second most common heating fuel in one state (Maine) after heating oil. Wood is not the most common heating fuel in any state, and it is unlikely that it ever will be – or ever should be. October 10, 2011 - Recently released US Census figures show the number of households heating with wood grew 34% between 2000 and 2010, faster than any other heating fuel. Electricity showed the second fastest growth, with a 24% increase over the last decade. In two states, households using wood as a primary heat source more than doubled - Michigan (135%) and Connecticut (122%). And in six other states, wood heating grew by more than 90% - New Hampshire (99%), Massachusetts (99%), Maine (96%), Rhode Island (96%), Ohio (95%) and Nevada (91%). Census data also shows that low and middle-income households are much more likely to use wood as a primary heating fuel, making low and middle-income families growth leaders of the residential renewable energy movement. According to the EIA, residential wood heat accounts for 80% of residential renewable energy, solar 15% and geothermal 5%. “Heating with wood may not be hip like solar, but it’s proving to be the workhorse of residential renewable energy production,” said John Ackerly, President of the Alliance for Green Heat, a non-profit organization based in Maryland. The rise of wood and wood pellets in home heating is driven by the climbing cost of oil, the economic downturn and the movement to use renewable energy. The Census Bureau does not track the reason people switch fuels but in states like Maine and New Hampshire where rising oil prices are squeezing household budgets, it is clear that many families simply feel the need to cut heating costs. “The rise of wood heat is good news for offsetting fossil fuels, achieving energy independence, creating jobs and helping families affordably heat their homes,” said Mr. Ackerly. 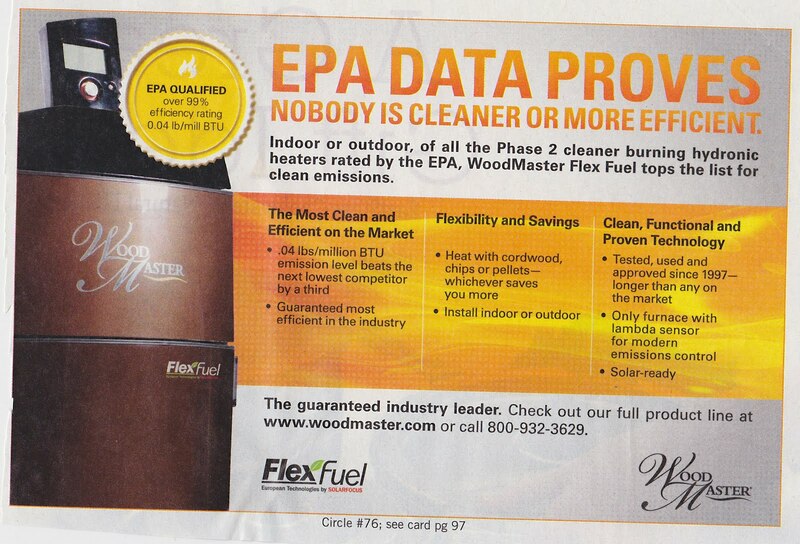 “However, Wood heat’s rapid rise is not just from people using clean pellet and EPA certified wood stoves. Many people are also dusting off old and inefficient stoves and in some states installing outdoor boilers that create too much smoke,” cautions Ackerly. Over the last decade, the number of households using two of the most expensive heating fuels significantly declined: propane dropped 16% and oil heat dropped 21%. Some of those homes undoubtedly switched to wood. Switching from fossil fuels to commercially purchased wood heat can reduce a home’s heating bills by half or more. Those who cut or collect their own wood save much more, using their labor to zero out heating bills. Currently about 25-30% of the 12 million stoves in the U.S. are clean burning pellet stoves or EPA certified wood stoves, according to the EPA and other sources. Americans have installed about one million pellet stoves since the 1980s when they were invented. Wood now ranks third in the most common heating fuels after gas and electricity for both primary and secondary heating fuel use, but ranks fifth, after oil and propane as well, when only primary heat fuel is considered. As of 2010, 2.1% of American homes, or 2,382,737 households, use wood as a primary heat source, up from 1.6% in 2000. About 10 - 12% of American households use wood when secondary heating is counted, according to the US Census Bureau and the Energy Information Agency (EIA). The rapid rise in wood heat as a primary heating fuel is mainly a rural phenomenon, and to a lesser extent a suburban trend. According to the US census, 57% of households who primarily heat with wood live in rural areas, 40% in suburban areas and only 3% in urban areas. The Alliance for Green Heat promotes wood and pellet heat as a low-carbon, sustainable and affordable energy solution. The Alliance works toward cleaner and more efficient wood heating appliances, particularly for low and middle-income families. The Alliance is a 510c3 non-profit organization based in Maryland. · The top ten states of per capita primary wood heating are: Vermont (15%), Maine (12%), Montana (8%), New Hampshire (8%), Oregon (7%), Idaho (7%), West Virginia (6%), Alaska (5%) and Wyoming (5%). · Four of the eight most populous states - New York, Pennsylvania, Ohio and Michigan - experienced increases in wood heat of at least 65%. · Rapid rise in wood heat is not just confined to states with very high use of heating oil. In Michigan and Ohio, for example, where the relatively inexpensive natural gas is dominant, wood heat still soared. · West Coast states, where laws regulating wood heating tend to be stronger, had modest increases in wood heating (6 – 12%) but it is unclear to what extent those regulations kept wood heat growth in check and to what extent other factors were responsible. · The only part of the country where wood fell as a primary heating fuel was the Deep South, where states experienced a 2 – 13% decline with the exception of Florida that declined 21%. · In a significant milestone, since 2000 wood has overtaken propane as a primary heating fuel in three eastern states: Maine, Vermont and West Virginia. This is the first time that wood has topped propane in an eastern state since 1970. · In Europe there has also been a rapid rise in wood and pellet heating, which has more to do with generous government incentives to help homes reduce fossil fuel use. Many European countries have had 25 to 50% incentives for much of the previous decade. · The US had a 30% tax credit up to $1,500 for only two years, 2009 and 2010. Currently the tax credit is only for 10% with a maximum of $300. · The number of homes heating with wood fluctuates much more quickly than other fuels because most families who use wood as a primary heat source also have a fossil fuel back-up which they use more of when or if that fossil fuel is more affordable. · According to the US Forest Service reports, a majority of Americans who heat with wood cut or collect their wood. · Some states with a more than 90% rise in wood heat have very high unemployment, such as Michigan and Nevada, ranked 1 and 3 for highest unemployment rates. But in New Hampshire, which also had more than 90% rise, unemployment is among the lowest in the US. Marketing claims by a number of hydronic heater manufacturers citing efficiencies up to 99% may run afoul of the Phase 2 Partnership Agreement between the EPA and manufacturers of Phase 2 units. The problem stems from manufacturers using the EPA’s name to explicitly or implicitly endorse the extremely high efficiency numbers that had been reported by test labs last year, but have since been called into question. Relevant language in the Phase 2 Partnership agreement includes: "Partner agrees not to construe, claim, or imply that its participation in the EPA Program constitutes federal government approval, acceptance, or endorsement of anything other than Partner's commitment to the Program. ... The Partner agrees to ensure that outreach materials describing this Agreement include statements that EPA does not endorse any particular product, service, or enterprise." 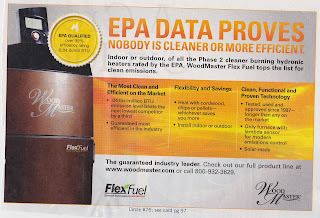 Note: When the Alliance contacted Wood Master, they readily acknowledged that this ad was misleading and should not have been printed and did not use it again. Now that the extremely high efficiency numbers obtained through the EPA Phase II partnership program have been discredited, the Alliance believes it is misleading to consumers for manufacturers to continue using them in advertisements for their products. The EPA should proceed with due haste to disassociate the Phase 2 program from such efficiency numbers.